After watching Stockton’s Pete Anderson Jr. and Ron Strmiska Jr. slice into his season points lead the last two weeks, Manteca’s Guy Guibor reasserted himself as the driver to beat for the 2006 Stockton 99 Speedway Havoline Western Late Model championship on Saturday, August 19th. Guibor started the 100-lap race from outside of the second row and calmly waited his turn as Anderson and #8, Joey Stearns, also of Stockton, battled for the lead throughout the early portions of the race laps. On a lap 46 restart Guibor swooped under Anderson for the lead and once he had the pack in his rear view mirror there was simply no touching him as he cruised to his third victory of the season. Anderson, who entered the night with a two race winning streak, fought an ill handling car the entire race, but he somehow managed to stay ahead of the remainder of the field for a hard earned second place finish. Anderson did get a couple of opportunities to start along side of Guibor due to late race cautions, but Guibor quickly disposed of him on each occasion. It was a good night to be out in front as mayhem reigned behind Guibor and Anderson as Mark Holeman of Los Altos, Salida’s “Slammin” Sam Solari, Chicago’s Pete Hernandez, Tracy’s #50, David Philpott, Stearns and Strmiska were all involved in an assorted variety of spins, fender benders and other mishaps. Solari eventually ended up third, Strmiska, despite two trips to the pits, managed to take fourth and young Justin Philpott, of Tracy, (right), registered a career best finish of fifth. It may be better to be lucky than good, but you can’t beat being both as Grand American Modified (GAM) points leader Jay Linstroth, of Citrus Heights, proved on Saturday. Linstroth started the 21-car GAM feature from the second position, but after quickly falling to third behind Benicia’s #25, Barry Callouette and Modesto’s Mike Beeler, he calmly drove into the top spot on lap 17 after Callouette and Beeler spun each other out. Making a bid for his first career win, Dixon’s #42, Jerry Dubach soon got by Linstroth for the lead, but Linstroth returned the favor on a lap 32 restart and went on to take his third win of the year. Dubach would hang on for second and Callouette regrouped to take third. It was a huge points night for Linstroth, who entered the evening with a narrow lead over defending champion Jason Philpot of Sacramento, Jason Kerby of Galt and Beeler, in the battle for the 2006 GAM season championship. With Philpot dropping out of the Saturday’s race early due mechanical problems, Kerby skipping the event due to a family illness and Beeler crashing out on lap 30, Linstroth is in dominant position to finally earn the championship he has long sought in the GAM finale on Saturday, September 9th. With a full field invert of the 21 cars starting the American Limited Stock Car (ALSC) everyone was anticipating a wild 30-lap ALSC feature and they were right. The start of the 30-lap race looked like a replay of last Saturday’s destruction derby as the cars in front swapped paint and punches while the top qualifiers sliced and diced their way through the field from the back. It took all of four laps, which included three yellow cautions, for Stockton’s Pete Anderson Sr. to move up from his number 18 starting spot and take the lead. It took a few laps longer for Stockton’s #1, Joe Allen, the night’s top ALSC qualifier and thus 21st starter, to make his way to the front and challenge Anderson. Allen made one last ditch bid for the lead by out braking Anderson going into turn three on the final lap, but Anderson was able to get on the throttle first coming out of turn four to take the checkered flag over Allen by about a half of a car length. ALSC division leader Chad “the Iceman” Holman, #75, finished in third to protect his sizable advantage in the standings, which stood at 62 points entering the night’s action, over Escalon’s Darrell Hughes, who finished the race fourth. Lathrop’s Mark Henslee continued his season long mastery of the Pro-4 Truck division by taking his seventh win of the year. Starting from the fourth position, Henslee patiently worked his way to the front, assumed the lead on lap eight and he never looked back. Henslee’s performance was so dominate that only four trucks out of the starting field of 12 were able to remain on the lead lap when the checkered flag waved to end the 30-lap main. Henslee also set fast time in qualifying and won the dash to register his third sweep in a row and fifth overall for the season. Oakdale’s Nathan McNeil finished the Pro-4 Truck race in second, nearly a third of a lap behind Henslee, and Hayward’s Walt Bruegger took third. The Stockton 99 Speedway will be dark next Saturday before returning to action on Labor Day weekend for a huge Tri-Holiday show on Saturday, September 2nd in which the West Car Late Model Series will decide its 2006 season champion with a 100-lap main event and the NASCAR Dodge Weekly Racing Series program will feature the Havoline Western Late Models in round #9 of the HOTWOOD 1000 Series, presented by J.M. Environmental, in a 100-lap feature, the Pro-4 Trucks and the American Limited Stock Cars, by C.L. Bryant. Stockton 99 Speedway promoter Ken Clapp is looking for a few good driving legends for the final race on Sept. 16. Clapp wants drivers who made a significant contribution during the track's 60-year history to show up on the final night as guests of Stockton 99. "We want as many as we can find; we want to find a way to say thanks to the many competitors who helped make this track a success," Clapp said. "Hopefully, we get a good group." Clapp said the former drivers would be introduced to the fans, and there would be an autograph session. 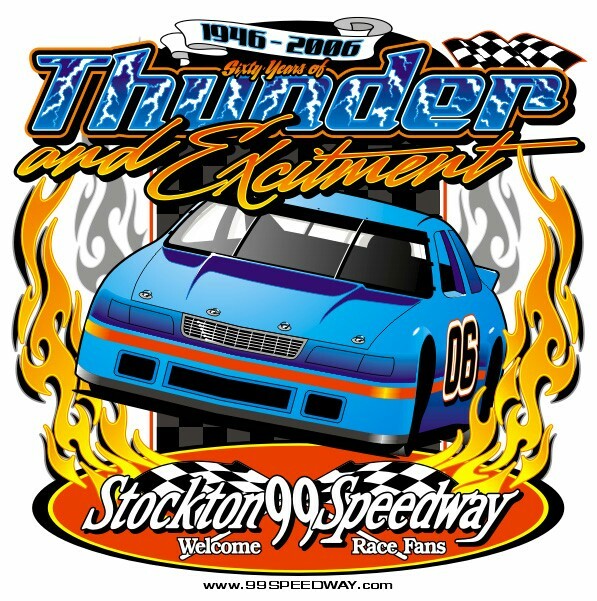 Stockton 99 is taking Saturday off, then will return with the final three race programs in track history. There will be 100-lap events for the NASCAR Western Late Model and WestCar Late Model Series on Sept. 2, and a program featuring the Western Late Model cars on Sept. 9. The Sept. 16 finale features the Western Late Models and the StockCar Racing League's Wild West Shootout, plenty of memories and fireworks.